An attempt to teach readers how to “think reliably and even gracefully about really hard questions,” Intuition Pumps and Other Tools for Thinking goes over rough intellectual terrain — consciousness, determinism, artificial intelligence, evolution, all decidedly daunting hills and valleys — with assurance and wit. If you have some patience, you’ll finish with clearer ways to examine and express your own thoughts — or, at least, that’s how I felt. There are some admittedly shocking jumps in difficulty. More than once I found myself, after twenty pages of lucid explanations, coming across a paragraph I had to read five times just to make certain I had understood it… and even then I wouldn’t have bet money on it. This is the kind of book that will make you feel confident one moment and absurdly out of your depth the next. When you’re jumping from physics, biology, computer science and cognitive psychology, that may just be the nature of the beast, but it fortunately never feels as though Dennett is being an obscurantist. He values lucidity, and by the end of this thing I was grateful. 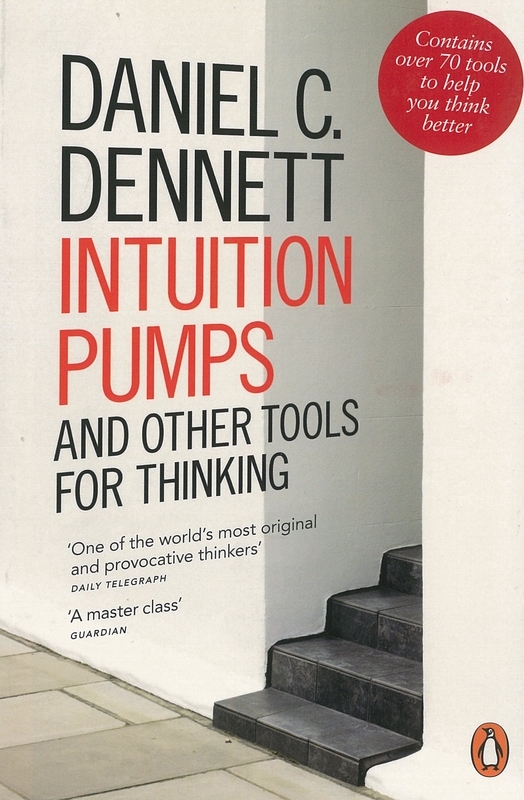 Dennett manages to glide from one mind-bending mystery to another and address each with wit, clarity, and frightening intelligence. It’s impressive that a man so fiercely bright can keep his work from being too intimidating: his tone is that of a kindly uncle, guiding you with patience through some of the most difficult conundrums your brain can handle. While this was sometimes dense to the point that it hurt my head, if you find any of the topics interesting you’ll be missing out on a feast for your brain if you don’t give Intuition Pumps a shot.